A modern art gallery is not your typical venue for a synthpop gig, but then Chvrches are not your typical synthpop band. Unquestionably THE new synth band of the moment, the buzz around this Glasgow three-piece has been phenomenal. 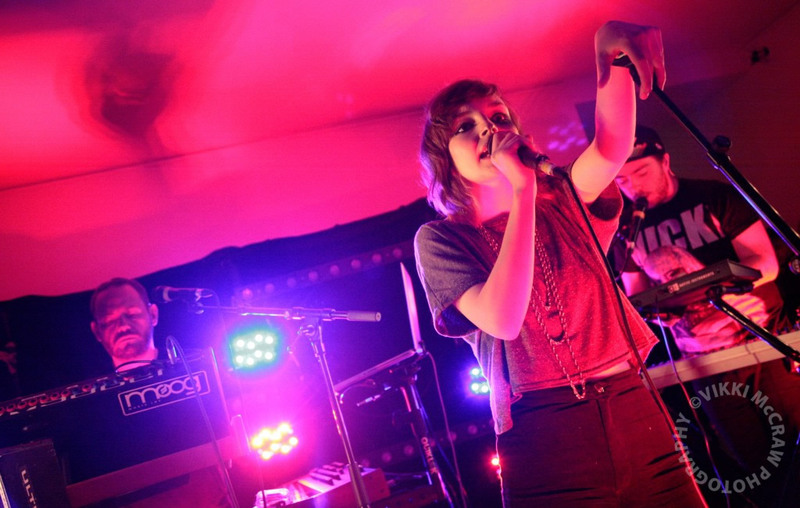 On the week that Zane Lowe premiered debut single ‘The Mother We Share’ on BBC Radio 1’s Next Hype, Chvrches became the Most Blogged About Artist ON THE PLANET. Not since La Roux has a retro synth-pop band made so many mainstream waves, and it’s all the more incredible when you realise that this is on the back of just two songs and a handful of small, carefully chosen gigs. 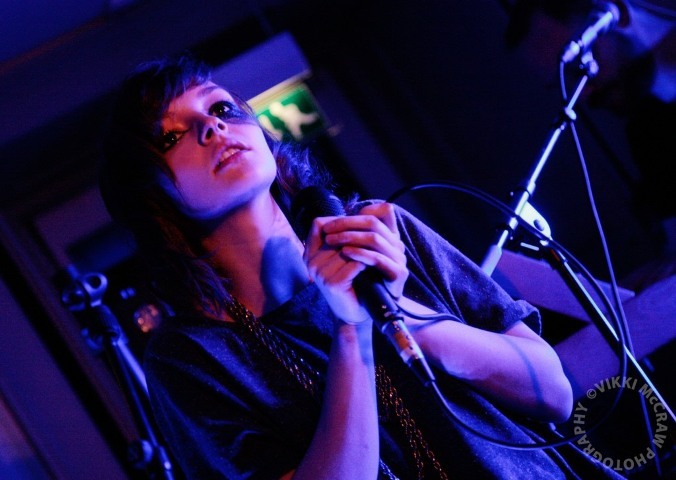 Friday night saw Chvrches as the centrepiece artists for ‘Picasso By Night,’ a special event held in Edinburgh’s prestigious Scottish National Gallery of Modern Art. The Scottish National Gallery of Modern Art is home to Scotland’s best collection of modern and contemporary art. With a façade proclaiming ‘Everything’s Going to be Alright’ (Martin Creed Work no. 975) and set in front of Charles Jencks dramatic, serpentine ‘Landform’ mound (which is like a sampler version of his Garden of Cosmic Speculation, the most awesome geek-space in Scotland), the gallery’s Modern One setting instils a sense of veneration and awe even before you set foot inside the building. In a first for the gallery, they’d opened their doors after dark for this one-off, sold-out event. This centred around the Picasso & Modern British Art exhibition with break-out activities such as art-inspired pop up poetry, Spanish lessons, curator talks about the Picasso pieces on display and of course music from Chvrches. 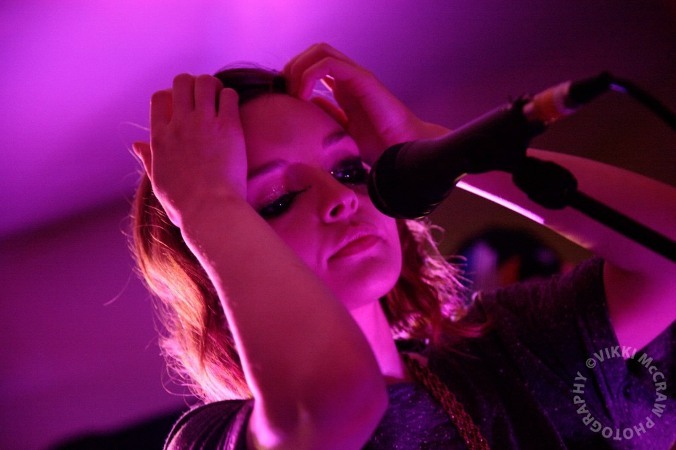 Pre-gig, Chvrches lyricist and vocalist Lauren Mayberry seemed a wee bit nervous. By now the cafe area was already filling up to bursting point (with the audience gathering around the stage on three sides) and she had mislaid her tambourine somewhere. For a band that takes every aspect of their sound and image with the utmost professionalism, I could see how a missing instrument might be cause for concern. For my own part, I was more worried that amongst the Macbook, Moog and Prophet on stage I’d spotted those instruments of the devil: a couple of guitars. Synthpop heresy! I needn’t have worried. From the first few notes of opening song ‘If We Sink’ I knew we were in for a supremely synthpop show. Lauren may come across visually as the angelic daughter of Claire Grogan and David Bowie, but she instantly stamps her own unique, Scottish-tinged voice to the songs with confidence and conviction. I was instantly hooked. Second song ‘Recover’ sees the trio really hit their stride, with Iain and Martin working the synths to create a tremendous tune that again is 21st century electro-pop without apology. “We only exist on the internet” quips Lauren sardonically, and by now it’s clear that she can command the stage with assured authority. Then single-of-the-year ‘Lies’ kicks in and I think it’s time to check out how the rest of the audience is reacting. And I see something quite amazing and unexpected. I notice that a respectful gap of a few feet has developed between the stage and the audience. I realise we’re not all dancing about like crazed electro-loons (yours truly excepted). Much like how an art fan would admire one of the Picasso paintings upstairs, the crowd seemed to have stepped back to appreciate the band as some kind of audio-visual art installation. Between ‘Lies’ and next song ‘Science’ Lauren pauses to recount her recent day of frustration working with marketing types, and she plants the seed firmly by quoting Bill Hicks. New song ‘Now Is Not The Time’ comes next, and this was probably my favourite song of the night, easily a hit single if things are just and clearly out-synthpopping anything contemporaries like Fever Ray, Hurts or Purity Ring have ever produced. Penultimate song ‘Night Sky’ finally sees the aforementioned guitar make an appearance, but it’s well down in the mix and sounding a wee bit Cocteau Twins so that’s fine. Then all too soon Chvrches’ flawless set comes to a close with the soon-to-be-legendary ‘The Mother We Share’. 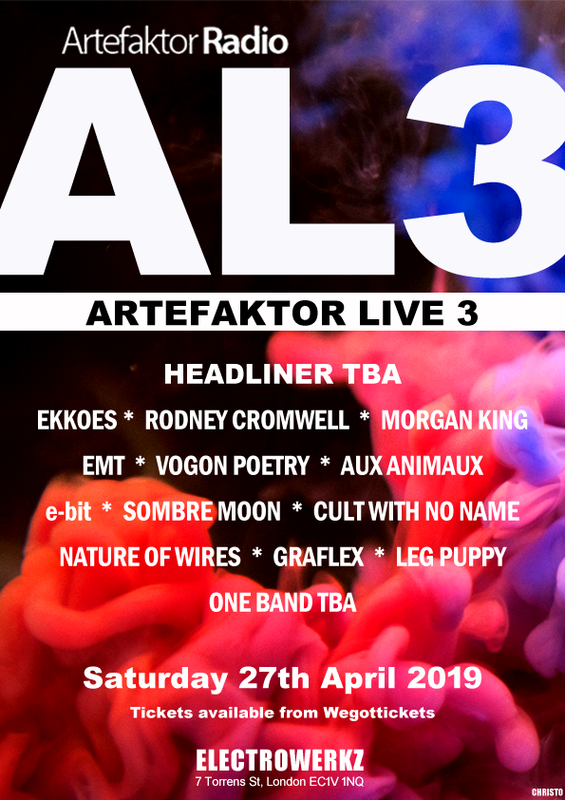 In just 30 minutes these three musicians have transformed from some anonymous internet band into one of the most dynamic and perfectly formed live synthpop acts I’ve witnessed in years. Pablo Picasso was famously prolific and consistently produced artwork of extraordinary quality. In concert, Chvrches are every bit as polished as they are in the studio. And if you’re one of those listeners thinking this Glasgow trinity can’t possibly have more than a couple of great songs in them, just wait till you hear these other pieces: you’re in for an almighty treat.